At long last, a mighty mural project at the end of North Lexington Avenue has begun to take shape. The outlines of the mural have already been drawn on the concrete supports of the Interstate 240 bridge spanning Lexington Avenue, and artists have begun adding color to the form. For 21-year-old Molly Must, the painting marks the realization of an idea she first had some three years ago. “It’s nice to get it off the ground,” Must said last week as she prepared to scale a scaffold and put acrylic paint to pillar. In 2005, Must dreamed of taking a dark overpass and turning it into a more vibrant place for passersby to enjoy. “I think public art should bring people together, or create an experience in some way by bringing people together,” the UNCA student said. Must pursued her vision. She helped create the Asheville Mural Project under the umbrella of the nonprofit Arts 2 People, and started planning. She worked with other local artists and residents to come up with a design, and she started landing grant money. Key donors include the city of Asheville, which gave $6,000 in taxpayers’ money; Greenlife Grocery, which contributed $1,000; and The EcoBuilders, which offered $500. Sherwin-Williams provided paint and primer. Despite the outpouring of energy and interest, the visionary still had to tangle with bureaucratic red tape. “I had no idea how much bureaucratic muck we would have to trudge through,” Must said. But trudge she did, and the mural has started coming to life. Working with fellow artists Josh Spiceland and Dan Beck, Must hopes to have the center section of the mural complete in about three weeks. The design depicts a timeline of sustainability, she said, highlighting the mural forms—a Cherokee woman and child, a colonial woman spinning thread, a bicycler, an architect and a man watering a garden. The section of bridge supports on the west side of the overpass will pay tribute to Asheville’s arts culture, Must explained. Artists Kurt Theasler and Steve Lister have been creating that design, and work will begin once the center section is complete. Must hopes to have the east-end side of bridge supports painted as well, but those plans aren’t firmed up. The center and west sections of the overpass will also have portraits of Asheville “saints” painted inside the columns, Must said, and people can nominate anyone for the portraits by going to http://www.ashevillemuralproject.org and clicking on the “nominate your Asheville Saint” button. Sizing up the mural, Must exuded the enthusiasm that’s seen her through the planning process. The Asheville Mural Project invites volunteers to work on mosaics that will be part of the mural. The mosaic work will be held Saturday, June 21, during the Asheville Building Convergence. Maybe you’ve been soothed by the strains of Wind Motika‘s calming flute. Perhaps you’ve gyrated with the Asheville Hoops women. Or you might have just jammed with some of the other musicians taking their turn. 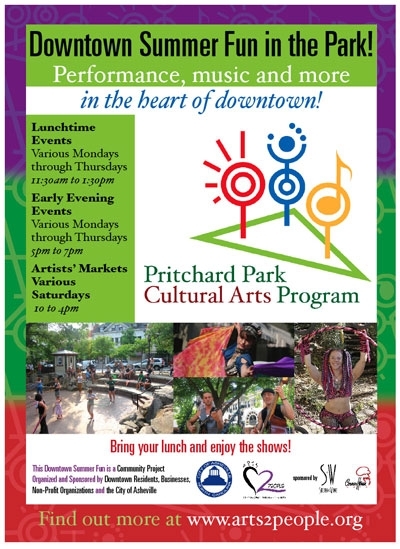 It’s all happening in Pritchard Park as part of an ongoing effort to make the park friendlier to downtown residents, workers and tourists. The cultural-arts programming, which started this month and is scheduled to run through September, is the latest move in the remaking of the triangular park in downtown Asheville. A city committee spent a year studying ideas to rejuvenate the park, and settled on a couple of ideas. Earlier this year, the city hired a park ranger with a $29,000 annual salary to help police the area. And City Council agreed to waive permits and fees and put another $10,000 in taxpayers’ money toward an effort to bring in artists and musicians. The committee raised $15,000 from private donors for the park’s arts programs. “I think it’s the city’s responsibility to provide programming to activate its parks—to lead the way—but the city can’t do it without help,” says Kitty Love, who is managing the park programming and works as executive director of the nonprofit Arts 2 People. Love wants to see downtown workers and residents support the scheduled events. She’s also looking for an additional $15,000 in support. Musicians play lunchtime gigs from 11:30 a.m. to 1:30 p.m., and there are some evening events scheduled from 5 to 7 p.m. Love has openings and encourages artists and musicians to sign up. She is also working on organizing an artists’ market that would be held Saturdays through the summer. “It’s the beginning of my vision of what Asheville needs, which is a Berkeley market, where people can bring anything and everything,” Love says, noting the funky California college town’s sprawling market of artists and street vendors. The goal: “Transform the way the park is used. You can’t wait for the park to be perfect. People need to come and support the activities,” says Love, who sees larger possibilities. 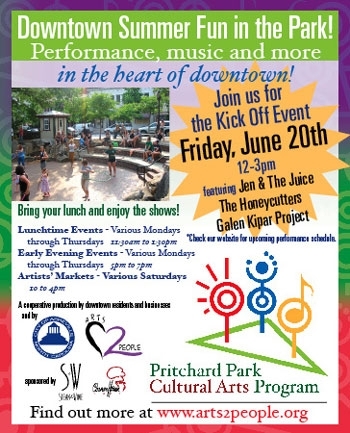 The Pritchard Park Cultural Arts Program will hold a kick-off celebration in the part from noon to 3 p.m. on Friday, June 20, featuring Jen and the Juice, The Honeycutters and the Galen Kipar Project. For more information about the program, visit http://www.arts2people.org.